To catch the attention of young children, sing with them before starting the story. We use gestures during the song so they will be more participative. To keep their concentration during the story, ask them to imitate the movements of some plant or animal, or even stars, water or wind, which is related with that part of the story. If you want the child to imbibe the spirit of the story, learn it by heart and practice how you are going to tell it to them. Even if you do not speak their local language, they will understand the language of the heart. 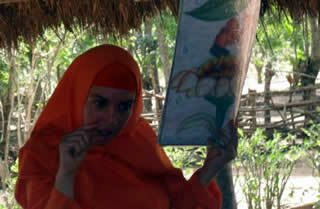 Even difficult topics can be understood through stories, such as geography, history, math, etc. Also students can learn good habits such as taking care of plants, loving the animals, and caring for younger brothers, etc, through imitation of the story characters. As an example of an activity, the children were requested to copy the small girl of the “The Adventures of Jyoti” who was feeling a deep love for all inside of herself. 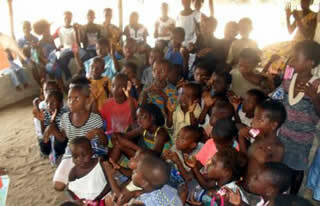 It was my first experience with these children (from a poor village around Accra, Ghana). For the older ones, to keep their attention, you can ask some scientific questions during the story, so that they can be share their knowledge with others. The questions related with the moral values of the story should be done only at the end. Then children should be free to ponder about the story‘s teachings and in no way should we censure their opinions. The teacher in a subtle way can lead them to understand the full meaning of the tale and its application in practical life.